3 India world's No. 1 arms importer 82% From Russia, China often equals. 3.5.1 Reuters) - The United States accounted for more than two-thirds of foreign weapons sales in 2008, a year in which global sales were at a three-year low, The New York Times reported on Sunday. The latest value for Arms imports (constant 1990 US$) in Qatar was 20,000,000 as of 2010. Over the past 42 years, the value for this indicator has fluctuated between 338,000,000 in 1998 and 2,000,000 in 1974. Definition: Arms transfers cover the supply of military weapons through sales, aid, gifts, and those made through manufacturing licenses. Data cover major conventional weapons such as aircraft, armored vehicles, artillery, radar systems, missiles, and ships designed for military use. Excluded are transfers of other military equipment such as small arms and light weapons, trucks, small artillery, ammunition, support equipment, technology transfers, and other services. Source: Stockholm International Peace Research Institute (SIPRI), Yearbook: Armaments, Disarmament and International Security. NEW DELHI: India has emerged as the largest arms importer in the world, overtaking even China, claims a report by a Swedish think-tank. The Stockholm International Peace Research Institute (Sipri), in its report to be released on Monday, said India accounted for 9% of all international arms imports between 2006-2010, making it the world`s largest weapons importer. Russia's arms exports are expected to hit an all-time high of over $10 billion in 2010, the head of Russia's state-run arms exporter Rosoboronexport said on Thursday. In 2009 Russian arms sales were worth $8.5 billion, including $7.4 billion worth via Rosobornexport. "Rosobornexport currently exports several thousand military products, expanding arms sales by $500-$600 million each year," Anatoly Isaykin told a news conference on the 10th anniversary of the company. Rosobornexport's portfolio of export orders is estimated at $40 billion, Isaykin said. Despite constantly expanding arms exports, Russia faces increasing competition on the international arms market from the United States, Germany, France and the United Kingdom as well as Chinese military expansion. Russia exports weaponry to over 100 countries. Its main arms customers are India, Algeria, China, Venezuela, Malaysia and Syria. Vietnam also emerged as a key importer after it signed a deal to buy submarines, aircraft and other military hardware from Russia late last year. FORTUNE -- This time last year, Boeing's F-15 production line, which is housed in a beige, dreary building on the outskirts of Lambert-St. Louis International Airport, was on the verge of shutting down. The F-15 is an old jet, first designed in the 1970s to outmaneuver Soviet MiGs. It has long been surpassed by more advanced rivals, and the U.S. military hasn't bought a new one since 2001. When production slowed to a trickle a few years ago, a pair of orders from Korea and Singapore kept the line alive, barely, and it has been churning out about one F-15 a month since then. Local politicians fretted that Boeing would have to close the production line, eliminating hundreds of jobs and delivering a blow to the struggling regional economy. Then, last summer, rumors surfaced about a deal -- a big one. The workers at the plant followed the news online, where defense publications reported on the details of the sale. The would-be buyer, they learned, was Saudi Arabia, and the proposed order was massive -- 84 planes, as well as upgrades to older jets. In October the Department of Defense, which administers sales to foreign countries, finally announced an arms package worth some $60 billion, including 70 Apache attack helicopters, also made by Boeing (BA, Fortune 500), and the fleet of F-15s. It was the biggest overseas arms sale in recent memory, and it extended the life of the production line through 2018. The F-15 may live even longer -- a Boeing executive says there are two other overseas buyers waiting in the wings. Dale Lauer, a 52-year-old flight mechanic, smiled slightly when I asked him what he thought about the news. "People thought this program was dead a long time ago." Far from it. Thanks to a surge in overseas demand, the F-15 and other aging U.S. weapons systems are hotter than they've been in years. The Department of Defense last year told Congress of plans to sell up to $103 billion in weapons to overseas buyers, a staggering rise from an average of $13 billion a year between 1995 and 2005, according to Deutsche Bank analyst Myles Walton. Signed agreements have tripled since 2000. As defense giants like Boeing, Raytheon (RTN, Fortune 500), and Lockheed Martin (LMT, Fortune 500) increasingly seek to peddle their wares to well-financed (sometimes by the U.S.) international customers, they have a surprising ally: the President. "Obama is much more favorably disposed to arms exports than any of the previous Democratic administrations," says Loren Thompson, a veteran defense consultant. Or, as Jeff Abramson, deputy director of the Arms Control Association, puts it: "There's an Obama arms bazaar going on." Administration officials say the boom in arms exports is simply the result of healthy demand. Indeed, American-made arms are widely considered the best and most coveted weapons in the world. But the Obama team has hustled to pave the way for big sales like the Saudi deal; the President himself recently sought to secure a pending $4 billion aircraft deal with India. Obama is also backing a massive push to rewrite the rules that govern arms exports, a process that some say will reduce oversight of U.S. weapons sales. For the administration, robust international arms sales advance domestic goals, like bolstering exports and supporting a defense workforce of more than 200,000. Weapons transfers are also a subtle yet potent form of diplomacy: By arming its allies, the U.S. can spread the burden of policing hot spots (the Middle East, the Korean peninsula). And arms exports give Obama's State and Defense departments tremendous negotiating clout with buyers. But critics contend that supplying some nations with advanced weaponry is a risky strategy, especially as the Middle East, which is teeming with American-made arms, crackles with the sparks of regime change. While the U.S. sells weapons only to its allies, power can shift quickly -- just look at Tunisia and Egypt. Even Saudi Arabia, with its 86-year-old monarch, could see a change in leadership. When friends become foes, arms exports become a liability. The government sold dozens of F-14 fighter jets to Iran in the 1970s before the Shah was deposed. Since then the U.S. has systematically destroyed F-14 parts to keep them out of Iran's hands. Weapons proliferation watchdogs expected the volume of exports to decline when Obama became President; instead the reverse has happened. Thompson pins the surge in large part on the recession. Production lines for Boeing's F-15, Harpoon missile, and Apache helicopter are sustained by exports, which support thousands of high-paying, highly skilled manufacturing jobs. But Thompson also believes that the President has other motives for supporting foreign arms sales. "It's about U.S. alliances, it's about maintaining jobs, and it's about America's broader role in the world -- and what you have to do to maintain that role." Defense contractors like Boeing are notorious for spreading their manufacturing outlets across the country to curry political favor; the Chicago-based company has facilities in more than 20 states, supported by mom-and-pop subcontractors in dozens of districts. But its heart beats in Arlington, Va., which is where it gets its lifeblood -- government spending. There, executives in crisp suits walk alongside uniformed servicemen. Many of those officers will leave the military and walk straight into corporate gigs; Boeing's head of business development for military aircraft, Lt. Gen. Jeffrey Kohler, used to run the Pentagon agency that oversees arms exports. Although most contractors have their headquarters elsewhere, they all have offices in D.C. for a reason: The industry does 80% to 90% of its business with the Pentagon. And business recently has been good: The U.S. government has more than doubled its defense budget since 2001, to about $700 billion, almost as much as every other country in the world spends combined. In December, Congress agreed to spend $725 billion on defense in 2011. But while defense spending continues to rise, the mood in Arlington is somber. With two wars coming to an end and a massive federal deficit, it seems inevitable that, as Pentagon comptroller Robert Hale put it, "the spigot is starting to close." Though Secretary of Defense Robert Gates has requested a slight increase in spending over the next few years, defense analysts are skeptical that the budget can go anywhere but down. 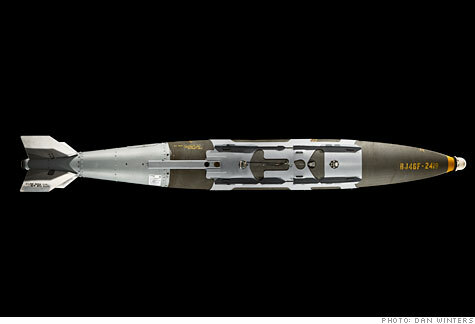 Walton, the Deutsche Bank analyst, says investors are pricing in a 30% decline in weapons spending over the next decade. "We're at a procurement peak this year," says Richard Aboulafia, an aerospace analyst at the Teal Group. "There's no disguising the fact that it's at best plateauing, and most likely going to soften." In response, Boeing and its peers are following the same path as the rest of corporate America -- out of the country. Foreign arms sales, once viewed as icing on the cake, are now the focus of the industry's growth strategy. Honeywell (HON, Fortune 500) recently created a new international sales division. (EADS, a European defense conglomerate, plans to establish a headquarters in Asia.) Many companies have set targets for international growth. Lockheed, which currently gets 14% of its revenue from outside the U.S., wants to boost that figure to 20% by 2012, and Boeing's defense division aims to grow international sales to 25% from 17% today. Raytheon now derives 23% of its sales from other countries, the most of any big contractor. Analysts say that's because it sells affordable gear -- missiles, upgrades, and radar -- as opposed to jets that cost $100 million apiece. Raytheon does sell one large program, the Patriot, a radar-guided firing system that shoots down ballistic missiles. Two years ago, Culligan says, a $3.3 billion order from the United Arab Emirates enabled the company to restart the Patriot production line and add new features like radar digital processors, which, in turn, lure more international customers. The strategy is working: Raytheon's domestic revenue was up just 1% last quarter, according to its CFO, but its international sales grew 11% to 12%. The countries with the biggest appetite for U.S. weapons are, conveniently, the same ones that have the money to buy them: oil-rich nations in the Middle East. Nearly 50% of foreign military sales signed between 2006 and 2009 were with Middle Eastern countries, according to the Congressional Research Service. During that time, Saudi Arabia purchased about $13 billion worth of American weapons; the UAE spent $11 billion. Iraq, poised to get rich from its own oil reserves, is a growing customer. All major defense contractors are profiting from the region, but none more so than Boeing, which was the major beneficiary of the Saudi deal. Mark Kronenberg, Boeing's head of international business development, attributes the buying spree to a natural replacement process, just as in any other business cycle -- mainframe servers and car engines, for example. "The last time we had a period like this in the Middle East was the early '90s," he says. "Here we are, 20 years later, and they're recapitalizing." There are other, less innocuous reasons: a weakened Iraq, the terrorist threat in Yemen, and most important, the country that defense executives call the Gulf's "dangerous neighbor" -- Iran. "You hear it almost on a daily basis. Iran is flexing its muscles, most of it through offensive capabilities," maintains Abdulkhaleq Abdulla, a political science professor at UAE University. As a result, he says, small countries like the UAE feel pressure to try to keep up with their neighbors. Though the Obama administration is reluctant to tie the recent Saudi deal directly to Iran -- in a press conference announcing the sale, Assistant Secretary of State Andrew Shapiro dodged questions on the matter -- the connection is obvious, says Gregory Suchan, who headed the State Department's arms transfers program from 2003 through 2007. Suchan, now a consultant, says the F-15 deal was in the works as early as 2006 -- the same year that Iran said it would reject any UN efforts to halt its nuclear program. It took years of political legwork to execute the transaction. Lobbyists had to sell the idea to Congress, which has the power to stop major defense transfers -- something it has never succeeded in doing. Only a few sales have stirred major controversy, and all were to Saudi Arabia: AWACS sentry planes in 1981, Harpoon missiles in 1986, and Joint Direct Attack Munition (JDAM) bombs in 2007. There was also the matter of persuading Israel to play ball. For decades the U.S. has promised to ensure Israel's military edge over its neighbors, and while the government doesn't like to admit it, arms deals to other countries tend to coincide with concessions to the Israelis. In 2007, the year in which the JDAM deal was announced, the U.S. boosted its military aid to Israel by about 25% annually, to $3 billion a year. Last October, right before the announcement of the F-15 sale, Israel ordered 20 F-35 planes, Lockheed's top-of-the-line fighter jet. Diplomatic cables released by WikiLeaks dating back to the summer of 2009 describe negotiations surrounding the sale of the F-15s to Saudi Arabia; they were ultimately stripped of long-range weapons systems. When the deal was announced in late October, the pro-Israel lobby barely batted an eye. Neither did Washington. On Nov. 10, just nine days before the end of the 30-day period in which Congress can issue a resolution to halt an arms sale, a group of House members sent Secretary of State Hillary Clinton and Defense Secretary Gates a list of questions about the sale -- a "relatively soft gesture," laments Abramson. The transaction sailed through without incident. Abramson and other arms watchers have concerns about the Saudi deal. They question the wisdom of selling weapons to a country that the State Department has criticized for funding terrorists and for human rights abuses. It's also unclear whether the equipment is even useful. The new attack aircraft could intimidate Yemeni terrorists, but they would do little to combat the primary Iranian threat: nuclear arms. "Somehow this is supposed to signal to Iran: We've got you cornered here," says William Hartung, director of the arms and security initiative at the New America Foundation. "The logic in terms of strict military calculation doesn't really seem to add up." Others say arms sales are just one part of a complex dance the U.S. engages in with allies. Lawrence Korb, a senior fellow at the left-leaning Center for American Progress and former assistant secretary of defense, points out that when the U.S. sells conventional arms to Saudi Arabia, for example, it deters the country from pursuing nuclear options. "Are there some downsides?" he asks. "Sure. But the benefits right now probably outweigh them." Before every arms sale, the State Department must gauge the effect on regional dynamics and record the transaction -- something it doesn't always do correctly, according to a September report from the Government Accountability Office. The report took the department to task for failing to document its justifications for several sales and blasted its record keeping. Some export licenses, it said, were actually counted twice. The authors concluded that they had no idea exactly how many weapons were being sold in the Middle East. A few days before I flew to St. Louis, I stopped in Marietta, Ga., the home of one of Lockheed Martin's aircraft plants. On Dec. 16, the company held a ceremony to celebrate the $900 million sale of six C-130J Super Hercules turboprop planes to India. There were several Indian pilots in the crowd; they had spent months training at the Air Force base in Little Rock to fly the aircraft back to India. After standing for both the American and Indian national anthems, we watched a video of the C-130J taking off and landing, several times, set to loud rock music. The ceremony's VIP, Deputy Assistant Secretary of State Beth McCormick, gave a short speech. As the head of the Department's arms transfers program, McCormick effectively oversees every single military item that leaves U.S. shores. McCormick handed a giant key to Air Commodore Jasbir Walia, who coordinates air force dealings between the two countries. Suddenly classical music -- the kind played at high school graduations -- blared over the loudspeakers. The hangar door slowly rose to reveal the C-130J, painted with Indian insignias and awash in fog. With its bulky, rounded exterior and winking propellers, the plane, which has carried paratroopers in Iraq and Afghanistan, looked oddly cherubic. It was, as a Lockheed executive had told me earlier, the perfect deal to kick-start a relationship with India: seamlessly executed and nonthreatening. For decades, India had mainly bought Russian-made arms. In 1998 the U.S. banned India from purchasing American weapons after the country held a series of nuclear tests; President Bush lifted the ban on arms sales in 2001. A few years later the weapons notifications started to trickle in. First there was the C-130J, a tactical air-lifter that can take off in rough conditions and fly across continents. Then, in 2009, the Indian air force purchased eight P8 surveillance planes from Boeing, worth an estimated $2.1 billion. When Obama visited India last November, he secured a preliminary agreement to sell 10 Boeing C-17 transport jets, a deal worth about $4.1 billion. Before the year was over, India had put in a request for 22 Boeing helicopters. Analysts estimate that India could spend upwards of $100 billion over the next decade on new military equipment. Boeing and Lockheed are still in the running for the granddaddy of arms competitions -- a more than $10 billion deal to supply India with 126 fighter jets. "We are entering a period where we're trying to understand each other and trying to engage each other more," says Air Commodore Walia. "It's a test case for both sides." McCormick, the State Department official, seems to agree. "Working with India is just such a natural thing," she says. "I see them as being the ones who are going to step up at times and do things in the world." Stepping up -- or "burden sharing," as military types like to call it -- is the theory that arming allies with U.S. weapons will lighten the load for U.S. troops. "There is a belief in the region that the U.S. is gradually disengaging," says Mustafa Alani, a senior adviser at the Gulf Research Center in Dubai. "The U.S. is trying to transfer some of the defense responsibility to the regional states -- most of these deals are supposed to be delivered between 2015 and 2020." Another buzzword is "interoperability," which refers to the military's capacity to coordinate attacks with its allies. It is a useful selling point for contractors. China, Russia, and the U.S. are vying to sell Turkey missile launchers worth up to $4 billion, but only Raytheon's Patriot system can seamlessly communicate with other U.S. launchers in the area. While government officials deny using weapons for quid pro quo arrangements, defense experts say they are effective carrots. Simply put, countries tend to do what the U.S. wants before -- and after -- major arms deals. Weeks after Obama left India, the country increased sanctions on Iran. Saudi Arabia and India, two of the biggest buyers of U.S. arms last year, are reportedly planning to hold joint military exercises. There is a perception overseas that America strong-arms foreign leaders into buying its wares. U.S. officials dispute that accusation. When I asked McCormick if there was an overarching policy behind the recent spate of deals, she looked miffed. "You seem to imply we're out on some big crusade here," she said. "We're responding to demand." Even congressmen are conscripted for the cause. In a February 2010 cable from New Delhi, the embassy sounds a plaintive note to Sen. John Kerry (D-Mass. ): "Given an opportunity, we ask that you endorse Indian purchases of U.S. equipment as an important part of our defense relationship and support our ongoing sales efforts." Perhaps the most striking account of arms advocacy, though, is a December 2008 cable from Oslo that recaps the embassy's push to persuade Norway to buy Lockheed Martin's Joint Strike Fighter (JSF) instead of the Gripen, a fighter jet made by Sweden's Saab. The cable reads like a Lockheed sales manual. "The country team has been living and breathing JSF for over a year, following a road to success that was full of heart-stopping ups and downs," wrote the American official. He lists helpful suggestions for other diplomats looking to promote weapons: work "with Lockheed Martin to determine which aspects of the purchase to highlight"; "jointly develop a press strategy with Lockheed Martin"; "create opportunities to talk about the aircraft." "Promoting economic security and prosperity at home and abroad is critical to America's national security, and thus central to the Department of State's mission," the department spokesman wrote in an e-mail. Weapons advocacy isn't new; critics of arms proliferation have long alleged that U.S. diplomats work as salesmen for the defense industry. But some say the government has cranked up its campaigning efforts. "In the old days contractors used to complain all the time that U.S. embassies wouldn't help them," says defense consultant Thompson. "That's changing. Our embassies are working hand-in-glove with the U.S. defense industry in order to try to promote our military exports." Arms watchdogs say that's just one facet of the administration's push to support weapons exports. "It is really surprising to me that this particular President would be, from a regulatory and policy framework, so willing to enhance U.S. arms sales and make it a cornerstone of his national security policy," says Rachel Stohl, the author of The International Arms Trade. Besides the massive jump in proposed foreign arms sales, she takes issue with a September treaty that enables the U.S. to sell weapons to Britain and Australia with little oversight, and Obama's waiver in October of the Child Soldiers Prevention Act, which forbade arms sales to countries like Sudan and Chad. The critics' biggest indictment, though, is reserved for a wonky initiative that's received little attention outside D.C.: export control reform. Several Presidents have attempted to change the rules that govern foreign arms sales, but all failed to make much headway. In just two years Obama has announced a series of sweeping changes that could revolutionize the way we export weapons. Under the current system, the State Department must clear all weapons exports strictly for military use, such as munitions, while so-called dual-use items -- products such as machine tools that can be used for both military and commercial purposes -- are regulated by Commerce. Dual-use products can be sold to China, while military items cannot. Defense companies say they must file thousands of military license applications each year for items as small as bolts and door latches -- a process that can cause costly delays and deter buyers who can procure some of those items elsewhere. The administration -- spurred, insiders say, by Secretary Gates -- wants to revamp both lists to better protect the industry's "crown jewels." The goal, they say, is to build higher walls around items like stealth jets. In December they put out their first draft of a new military list for tanks and associated products. It eliminates 74% of the items on the old list, making them easier to export. Watchdogs fret that pushing more items onto the Commerce list would allow arms to circulate more freely -- and fall into the hands of countries like China or Iran. "Technology could be stolen and then used to improve the weapons systems of competitors and then enemies," argues Matthew Schroeder, head of the arms-sales-monitoring project at the Federation of American Scientists. Conservative politicians are divided; some favor less regulation, while others say national security comes first. Business, meanwhile, unilaterally supports reform: Numerous contractors have lobbied the government on the issue, according to congressional records, including Boeing, Lockheed, and Raytheon. Government officials walk a fine line in promoting the changes; though they tout the economic benefits of reform, they also play down financial motivations. "It's being done primarily for national security reasons," said a senior administration official. And yet American defense companies stand to benefit. Obama announced the latest arms export reforms at a meeting of the new President's Export Council, which aims to double U.S. exports by 2015. The chairman of the council? Jim McNerney, the CEO of Boeing. The St. Louis story is, for now, a happy one. When I visited the plant late last year it was buzzing with activity; assembly workers were climbing up and down scaffolding and drilling wings together. But for all the talk of how good the Saudi deal would be for jobs, Dan Schell, the F-15's production head, says he isn't likely to expand his workforce much. Indeed, the U.S. aerospace workforce has shrunk by 40% in the past 20 years. Like many other industries, the defense sector has been quietly outsourcing production (and jobs) to cheaper labor markets overseas. Part of that is mandated by the terms of export deals, which often require sellers to subcontract work to manufacturers in the buyer's home country. These clauses -- called "offsets" -- help companies win contracts, but they come at a cost: A little-noticed Commerce Department report noted that $2.2 billion worth of offset transactions in 2009 could have created or sustained more than 10,000 jobs in the U.S.
Defense executives maintain that even without offsets, they would still have to use foreign suppliers to keep costs down. Global competition, they say, is fiercer than ever. Russia, America's perpetual runner-up in arms exports, courts customers that the U.S. won't touch, like Venezuela. China, which recently flight-tested its first stealth fighter, has demonstrated an adeptness in producing knockoffs of Russian weapons. And Obama is not the only world leader lobbying for homegrown companies. The dust had barely settled from his India trip when Russian President Dmitri Medvedev and French President Nicolas Sarkozy swooped in, both pushing hard for arms sales. Jeff Johnson, a Boeing executive, says the F-15 production line would have been shut down years ago if Boeing hadn't made parts overseas. "At the end of the day, it's about business," he says. But defense is a business unlike any other. It benefits tremendously from taxpayer largesse: The government has given these private companies hundreds of billions of dollars for research and development, which enabled them to make best-in-class products that the rest of the world covets. They funneled that money back into the economy by creating thousands of gold-standard American jobs -- jobs that have been disappearing even as U.S. weapons spending soared. Unlike most other businesses, arms makers play a central role in U.S. foreign policy, perhaps now more than ever. The U.S. has sent billions of dollars' worth of arms to countries in the Middle East, like Egypt and Yemen, which are among the biggest recipients of U.S. military aid. As power shifts take hold, Obama may be forced to reconsider arms sales to the region negotiated in less tumultuous times. Chances are he'll stay the course. Even dovish Presidents have succumbed to the utility of arms exports. Take Jimmy Carter, who addressed the issue in a 1976 campaign speech: "Sometimes we try to justify this unsavory business on the cynical ground that by rationing out the means of violence we can somehow control the world's violence. The fact is that we cannot have it both ways. Can we be both the world's leading champion of peace and the world's leading supplier of the weapons of war?" Two years later Carter sold 200 fighter jets to the Mideast. --Correction: An earlier version of this story incorrectly identified Lockheed Martin's C-130J as a jet. It is a turboprop plane. India world's No. 1 arms importer 82% From Russia, China often equals. China was relegated to second place, notching 6% of global arms imports, Siemon Wezeman of Sipri told international news agencies. The US remains the largest arms exporter, followed by Russia and Germany, as per the report. This is not the first time that India has topped such an international list. As reported by TOI earlier, US Congressional Research Service's reports on conventional arms transfers placed India right at the top in 2004 and 2005, with agreements worth $5.7 billion and $5.4 billion respectively. China, however, hides more than what it reveals. Beijing`s military expenditure figures as well as its acquisition of advanced weapon systems and platforms remain shrouded behind a thick iron curtain, which global monitors cannot penetrate easily. Unlike India, China has rapidly built a robust domestic defence-industrial base (DIB) over the last couple of decades, which often also revels in reverse-engineering top-of-the-line weapon systems developed by other countries. "China does spend staggering amounts in importing weapons from countries like Russia, often displacing even India as Russia`s largest defence customer,`` said an Indian defence official. If India`s defence budget for the coming fiscal is pegged at $36 billion, China is "officially`` going to spend $91.5 billion. Experts, however, reckon that it will spend almost twice the amount on its 2.5-million strong People`s Liberation Army. But all this does not take away from the fact that India has certainly cranked up the modernization of its armed forces since the 1999 Kargil conflict, inking arms deals worth over $50 billion since then, the majority of them with foreign armament majors from Russia, Israel, France, UK and now, increasingly the US, as tracked by TOI. With limited private sector participation, coupled with DRDO, eight defence PSUs and 39 ordnance factories largely failing to deliver, India remains saddled with a poor DIB. So, with the armed forces continuing to import almost 70% of their requirements from abroad, India will remain a big time arms importer for the foreseeable future. There are several mega defence projects in the pipeline, which will see also tie-ups with foreign companies for technology transfer for indigenous production. The gigantic $10.4 billion project to acquire 126 medium multi-role combat aircraft, for instance, is in the final lap now, with commercial negotiations slated to soon begin with the eventual winner among the six aviation majors in contention. Two major deals on the verge of being inked are the over $2.1 billion deal for the Mirage-2000 fighter upgrade with France and the $4.1-billion one for 10 C-17 Globemaster-III strategic airlift aircraft with the US. India, incidentally, is likely to order another six C-17s after the first 10. Then, the armed forces are looking to induct over 600 helicopters, ranging from VVIP and heavy-lift to attack and light utility ones, many of them from abroad, for well over Rs 20,000 crore. Navy, in turn, is all worked up about launching its Project-75India to acquire six new-generation stealth submarines as soon as possible. The submarines, equipped with tube-launched missiles for land-attack capabilities and air-independent propulsion (AIP) to enhance operational capabilities, will be built in a project worth over Rs 50,000 crore. The "granny`` of all defence projects will be the joint Indo-Russian project to develop the Sukhoi T-50 fifth-generation fighter aircraft. With IAF looking to induct 250 to 300 of these stealth fighters from 2020 onwards, India will eventually spend over $35 billion on this project alone. Pakistan began with virtually no military production capability. By 1951, Pakistan had created the Pakistan Ordnance Factory at Wah Cantonment, near Rawalpindi, to produce small arms, ammunition, and explosives. During the period of reliance on United States supply, there was little attention given to domestic production, but after the assistance cutoffs in 1965 and 1971, Pakistan relied on China's help to expand its facilities, including the modernization of Wah. The Heavy Industries at Taxila was established in 1971 as an equipment rebuilding facility, followed in 1973 by the Pakistan Aeronautical Complex at Kamra, north of Islamabad. The air force assembled Chinese F-6s and French Mirages; produced the Mushak trainer, which was based on the Swedish SAAB Safari; maintained radar and avionics equipment; after the success of Mushak the Super Mushak and Karakoram-8 Advance jet state-of-art training platform were made. The Ministry of Defence Production was created in September 1991 to promote and coordinate the patchwork of military production facilities that have developed since independence. The ministry also includes seven other specialized organizations devoted to research and development, production, and administration. The navy is supported mainly by a facility at the Karachi Shipyard, which has limited production capacity. In 1987 development of a submarine repair and rebuild facility at Port Qasim was begun. By early 2000, in a joint project with China led to the development of the JF-17 Thunder fighter and the Al-Khalid Tank. Pakistan also has taken major steps to becoming self sufficient in aircraft overhaul and modernization and tank and helicopter sales and in a transfer of technology with France led to the construction of the Agosta 90 B Submarine in the late 1990s and early 2000s. After the success of its major developments in the defence industry the Defence Export Promotion Organization (D.E.P.O.) was created to promote Pakistani defence equipment to the world by inviting major and small players to the I.D.E.A.S. Exhibition, which is held annually at the Karachi expo center. In recent reports, the defence exports were worth over $200 million USD in 2006 and growing annually. Throughout the International Defence Exhibition and Seminar (IDEAS) at Karachi in November 2006, Pakistani firms have signed joint development, production and marketing agreements with defence firms from South Korea, France and Ukraine. These agreements include new reactive armor bricks, 155 mm artillery shells, and other developments in armor and land weaponry. These agreements all relate to the Pakistan Army's AFFDP-2019 modernization program of its armor, artillery and infantry. Pakistan's indigenous produced JF-17 Thunder. Pakistan plans to induct over 300 of these fighters. The Pakistan Air Force plans to retire several types of combat aircraft by 2019. Joint production and further development of the JF-17 Thunder light-weight multi-role fighter is ongoing and around 150 JF-17 are expected to be inducted by 2015, replacing all A-5C, F-7P, Mirage III and Mirage 5 fighter-bombers. The F-7PG will be replaced later and the JF-17 fleet may eventually be expanded to 300 aircraft. Orders have been placed for at least 36 Chengdu J-10 fighters from China, around 26 upgraded second-hand F-16AM/BM and at least 18 new-built F-16C/D Advanced Block 52. Two types of Airborne Early Warning & Control aircraft are to be introduced, 4 Saab 2000 Erieye AEW&C from Sweden and the ZDK-03, a Chinese AEW&C based on the Shaanxi Y-8F-600 cargo aircraft. The Il-78 aerial refuelling tanker is to be inducted and will be capable of refuelling the JF-17 and J-10, 4 are to be acquired second-hand from Ukrainian surplus stocks. The fleet of Shenyang FT-5 and T-37 Tweet is being replaced by around 75 K-8 Karakorum intermediate (jet) training aircraft. In 2005 Pakistan ordered four F-22P light frigates from China in a deal worth $600mn. The first is expected to be commissioned 2009 and the remainder by 2013. One of the frigates has already been completed and formally delivered to the navy, its formal induction in to the Pakistan Navy however, would take place at a later date. One of the F-22Ps will be built in the Karachi Shipyard. The F-22P is an improved version of the Type 053H3 Jiangwei II class light frigate, it has a displacement of at least 2500 tons. The first F-22P will be called PNS Zulfiqar, and thus become the Zulfiqar Class. Plans to procure 4 used frigates were dropped in favour of 4 new-built corvettes. According to Turkish press the Pakistan Navy is reportedly interested in procuring the Milgem class corvettes from Turkey. The frigate USS McInerney (FFG-8) with considerable anti-submarine warfare capability will be handed over in August 2010. According to Jane's IDEAS 2004 interview with former Pakistan Navy Chief ex-Admiral Kariumullah another four or so new frigates will be acquired. Kanwa Defence Review recently reported that the Pakistan Navy has shown recent interest in the Chinese Type 054 frigate. In mid-2006 the Pakistan Navy announced its requirement of three new SSK attack submarines to replace the two Agosta-70 submarines and rebuild its fleet – after retiring the 4 Daphne class. French naval firm DCN offered its latest export design – the Marlin SSK – which is based on the Scorpene SSK, but also uses technology from the Barracuda nuclear attack submarine. The German firm HDW offered the U-214 SSK. Credible reports confirm that the Pakistan Navy has opted for the Gernman U-214's which will be built in Pakistan and includes transfer of technology. According to Walter Frietag the contract has been finalised 95 percent. Pakistan is also seeking to enhance its strategic strike capability by developing naval variants of the Babur cruise missile. The Babur cruise missile has a range of 700 km and is capable of using both conventional and nuclear warheads. Future developments of Babur include capability of being launched from submarines, surface combatants as well as range extension from 500 km to 1000 km. The Airborne version of Babur, 'RAAD' has already been successfully tested. Reuters) - The United States accounted for more than two-thirds of foreign weapons sales in 2008, a year in which global sales were at a three-year low, The New York Times reported on Sunday. Citing a congressional study released on Friday, the Times said the United States was involved in 68.4 percent of the global sales of arms. U.S. weapons sales jumped nearly 50 percent in 2008 despite the global economic recession to $37.8 billion from $25.4 billion the year before. The jump defied worldwide trends as global arms sales fell 7.6 percent to $55.2 billion in 2008, the report said. Global weapons agreements were at their lowest level since 2005. Italy, the second ranked country, amassed only $3.7 billion in arms sales, while Russia ranked third with sales falling to $3.5 billion in 2008, down from $10.8 billion in 2007. The report attributed the increase in U.S. sales to "major new orders from clients in the Near East and in Asia" as well as to continued contracts for equipment and support services with globally based U.S. clients, the Times said. The United States also led in arms sales to the developing world, signing 70.1 percent of these weapons agreements at a value of $29.6 billion in 2008, the report said. Such deals with the developing world included a $6.5 billion air defense system for the United Arab Emirates, a $2.1 billion jet fighter for Morocco and a $2 billion attack helicopter for Taiwan. India, Iraq, Saudi Arabia, Egypt, South Korea and Brazil also reached weapons deals with the United States, the Times said. The report revealed the United Arab Emirates was the top buyer of arms in the developing world with $9.7 billion in arms purchases in 2008. Saudi Arabia ranked second with $8.7 billion in weapons agreements, and Morocco was third with $5.4 billion in deals.